"The Swiss Army knife of training exercises, use this routine to warm up, cool down, lower your horse's head, connect the rein to the feet, or to soften laterally." Every day of your life you must actively work to build and protect a direct link between your reins and your horse's feet. Don't ever pick up and place pressure on a rein if you don't want to see a change in direction or speed. If you inadvertently teach the horse that the reins mean nothing by picking them up several thousand times and asking for no change in either path or pace, then it's no wonder that you think left and it goes right. The steering wheel isn't connected to the wheels and you have no control. This exercise helps reinforce that connection, so while your doing it, it is very important that you only release your pressure on the reins when the horse SOFTENS AS HE'S TURNING, not when going straight forward. ​Begin at a stand still with zero pressure on the reins. Ideally they'd be dropped, lying on the horse's neck. Pick up the reins and move forward at either a walk or trot. It's your choice: At a walk you learn the exercise, at a trot the horse learns it. As you move, try your best to apply zero pressure to the horse's mouth. Look for a droop in the reins as proof of this. When you’re ready, ask the horse to turn by applying pressure on one rein or the other. For example, use your left hand to ask the horse to move in an arc to the left. Note that, while your left hand is asking for the turn by applying pressure to your horse’s mouth, your right hand should also play an active role, “helping out" the left by pulling out or adding slack. In this example, if you continually find yourself holding the rein either too close to the horse’s mouth or too far away (that is, you’ve got too much slack), then you’re not using that right hand to help the left. Both hands MUST be active. Go forward exactly two steps. Not one, not three... two. Being objective keeps you focused and it keeps you proactive, not reactive. It also forces you to improve your coordination and timing. If you want to make it three, that's fine, but pick a number and stick with it. Pick up the opposite rein, ask the horse to turn to the other way and repeat the process. From there you'll simply meander around, left then right, right then left. Make sure that when you ask for a turn, that you don't release until the horse is actively turning AND giving. (It's simple; just keep the horse turning till he softens and release the instant he does.) That helps keep (or make) the connection in the horse's brain between the rein and the feet. Tip: Set your horse up for success. Don't turn too sharply. 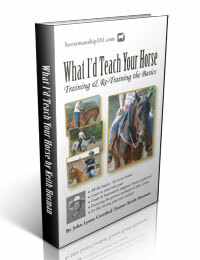 The article you're reading is cut from the book "What I'd Teach Your Horse: Training & Re-Training the Basics"
Available as an eBook, in paperback, and on audio. Here's a great exercise that you can (or should) start out your training sessions with every day forever. It relaxes the horse's body and causes it to lower its head. It reinforces the essential connection between reins and feet and it improves your turns. It also gives you many opportunities in a short time frame to get the horse to practice saying yes, which betters overall control. It's a core exercise in your regimen for all of those reasons plus it's something you can use anytime you need to calm down—or warm up—your horse. ﻿Remember our perennial rule: The longer you hang on to the rein, the less you should release on. Meaning, the longer you hang on to the reins, the less picky you are, the less the horse has to do to get a release. If you're looking for the head to drop (just as an example), then you might be looking for a two inch drop in the first few seconds... but after getting nothing for, say, twenty seconds, you might let go on 1/8 of an inch. If you pick up the reins and you feel no softening or dropping of the neck and time is passing you by, (let's say more than 30 seconds), then simply change your focus to the hip and ask the hip to move over a step, (as above). Your attitude at this point should be "It doesn't matter to me if you soften your neck or drop your head—but you're gonna move your hips sideways if you don't." So, with each repetition in your serpentine pattern, you will pick up the rein, count off the seconds in your head and if the neck doesn't soften or drop 1% more than the time before, just change your focus and ask the hips to move over. Release the reins when the hips move even if the neck remains stiff and raised. With enough practice, asking the hips to move one way then the other will have the effect of softening your horse's neck muscles, giving you the chance to further refine things with your hands. Concentrate throughout on ensuring that your horse is moving forward fluidly and evenly. Squeeze with both legs if you feel even a trace amount of hesitation (for instance, should you have to ask the hips to move). Also, be alert and careful to feel for the horse softening however slightly. Sometimes we start pulling so hard we don't realize that the horse couldn't relax even if he wanted to. Practice this serpentine often and progress to doing it at the lope. It's a terrific way to calm the horse, dissolve resistance in the neck and lower the head, teach it to follow its nose—and reaffirm that when you pick up the rein, those feet need to change somehow. It's also great anytime you're out riding and need to remind your horse of your existence.